Pleated dust collection cartridges are made up of 100 % spun bonded polyester media, like pleated dust collection bags media with different coatings on it, as per the requirement of applications. Construction wise Pleated dust collection bags & cartridges are one & the same, they are differentiated just for variation of filtration area. Dust collectors manufacturers / OEMs can replace conventional tube bags with pleated dust collection bags & cartridges with minor changes in the present equipment design. This polyester media is made up of high tenacity filament yarn without using any binding agent. Thus hard finished material is very stable against hot gas attack & structurally durable. This unique & hard finished material provides features of good pleat ability, high durability, and unique structure of very fine filament yarn which offer high performance in filtration. Thermally tight bonded media provide washability, excellent pleatability, stable structure, fine dust release & good resistance of particle penetration in to the media. 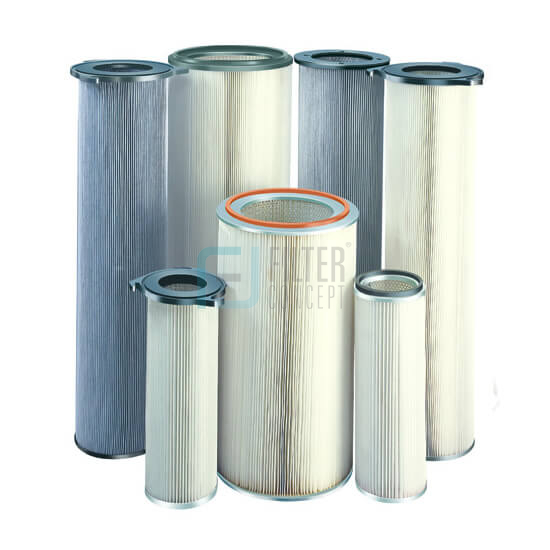 This filter media is pleated in different pleated depths & heights to accommodate desired filtration area. Pleated spun bonded polyester filter media is placed in a cylindrical configuration with support of metal core & encapsulated with metal end caps to form a pleated dust collection cartridge. The end caps are configured to mount as clean side or dirt side fitment. In case of metal caps these cartridges are supported with soft sponge rubber sealing to ensure positive sealing of filter while fitment.